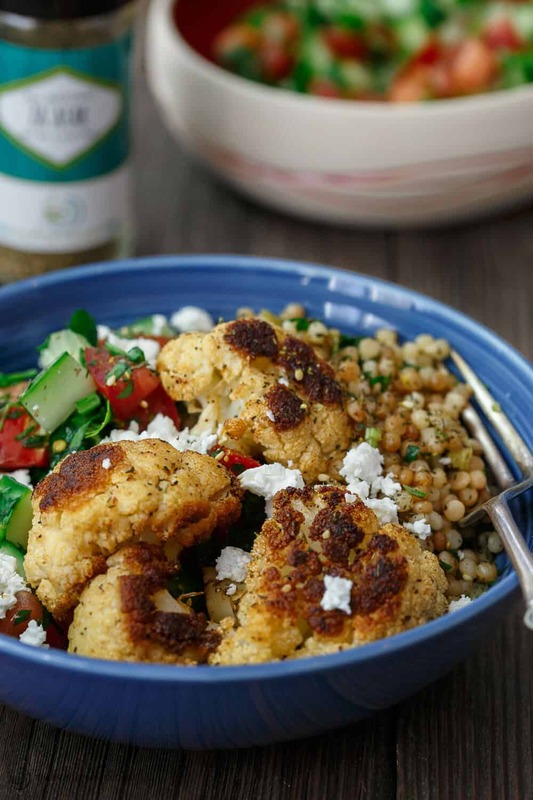 This tasty herbed couscous recipe easily turns into satisfying vegetarian dinner bowls with the addition of roasted cauliflower and a simple Mediterranean salad. Omit the feta for vegan option. Bonus: see my tips for perfectly roasted cauliflower! Dinner bowls have become a thing at my house lately. Since these grain bowls, I’ve been playing with different Mediterranean pantry staples to create more tasty bowls! 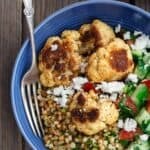 These herbed couscous bowls received rave reviews from my littles, I knew they’re worth sharing here! Let’s unpack the components of these herbed couscous bowls. Here’s a simple tip I recently came across. To achieve perfectly roasted cauliflower–flawlessly charred on the outside, nice and tender on the inside–cover the pan with foil for the first 10 minutes of baking. This will trap just enough moisture to help cook the cauliflower properly. Remove the foil for the remainder of the roasting time. Still, the cauliflower will remain moist enough to withstand the heat and will not dry up, even as it gains that nice and crispy char! Then, of course, we have pearl couscous, toasted in olive oil and adorned with spices, fresh parsley, and green onions. The finishing touches of our dinner bowls are as important. My favorite lazy Mediterranean salad, adding all the color and freshness. A drizzle of tahini sauce compliments the roasted cauliflower and rounds everything up. Simple components, but they make an amazingly nutritious and satisfying dinner bowl! 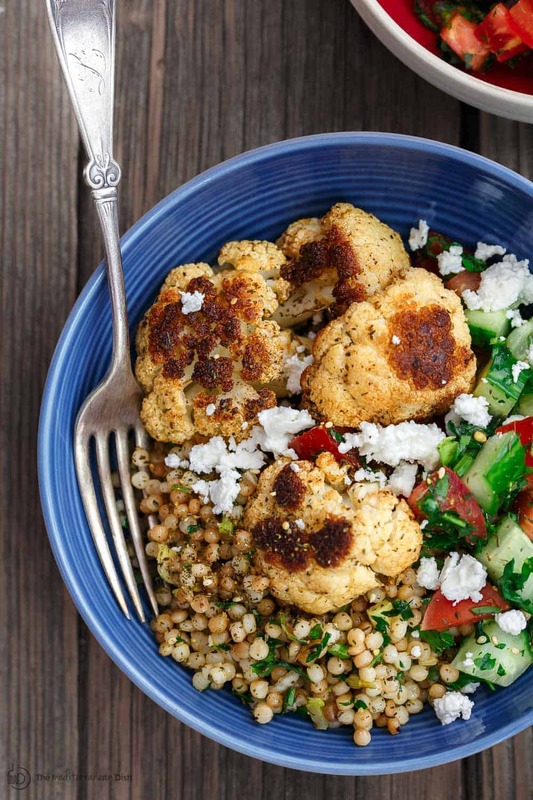 This tasty herbed couscous recipe easily turns into satisfying vegetarian dinner bowls with the addition of flavor-packed roasted cauliflower and a simple Mediterranean salad. Omit the feta for vegan option. Adjust one rack to bottom of your oven. Preheat oven to 475 degrees F.
In a small bowl, mix spices, salt and pepper. Set aside 1 tbsp of the spice mixture to be used later for the couscous. 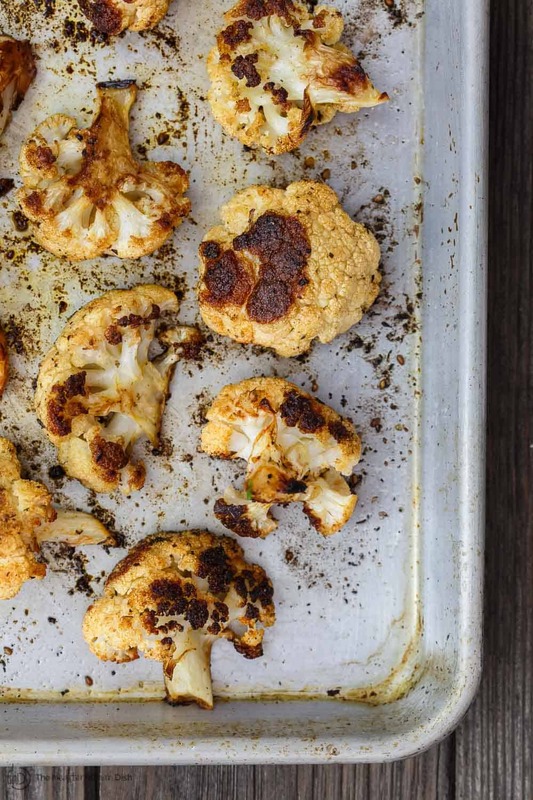 Place the cauliflower on a large sheet pan. Drizzle with extra virgin olive oil (you might use between 4 and 6 tbsp or so). Sprinkle the spice mixture on top of the the cauliflower (keeping aside 1 tbsp for later). Toss by hand to make sure all the cauliflower florets are well-coated with the olive oil and spices. Spread on the sheet pan in one layer. Cover the sheet pan with foil. Place on the bottom rack of the heated oven. Bake for 10 minutes. Remove from oven and uncover (discard foil). Return to heated oven, and bake for another 12 to 15 minutes. Remove again from oven, using a pair of tongs, turn cauliflower over on the other side. Return to oven for another 12 minutes (total baking time 37 minutes or so). While cauliflower is roasting, prepare simple Mediterranean salad according to this recipe. Prepare tahini sauce, if using, according to this recipe. Make the herbed couscous. In a saucepan, heat 1 tbsp extra virgin olive oil over medium heat. Add couscous and the remaining 1 tbsp of spice mixture. Saute, tossing regularly, until couscous is toasted into a light brown color. Add boiling water (consult package for amount of boiling water needed). Turn heat to low, cover and simmer for about 12 minutes or so, or until liquid is absorbed and couscous is fully cooked through. Remove cooked couscous from heat, and add chopped green onions, parsley, and lemon juice. Mix using a wooden spoon. Assemble your dinner bowls! 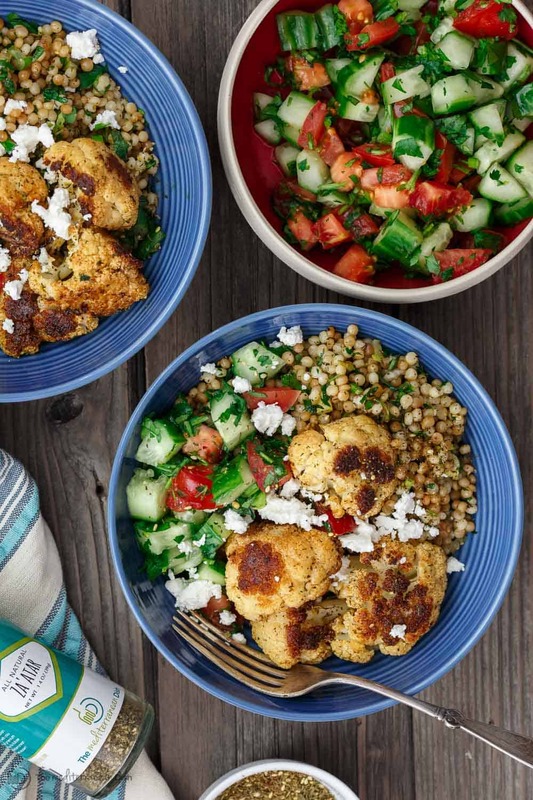 Divide herbed couscous and roasted cauliflower among 4 dinner bowls. 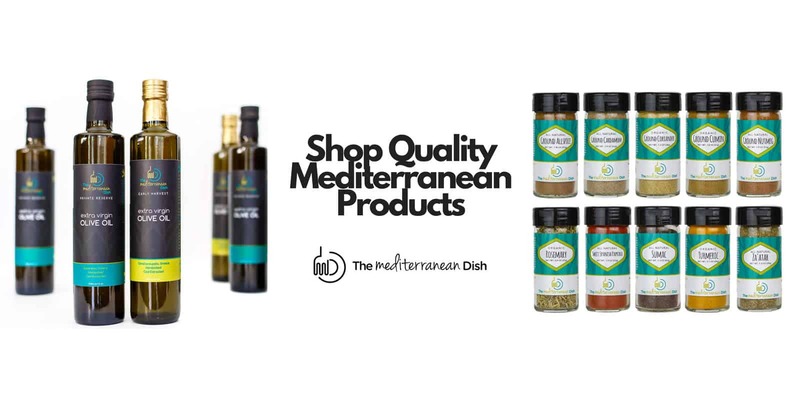 Add 3-ingredient Mediterranean salad to each. Sprinkle feta cheese and a pinch more Za’atar, if you like. Drizzle a little tahini, particularly over the cauliflower, if you like. Enjoy! Cooking tip: To achieve perfectly roasted cauliflower–flawlessly charred on the outside, nice and tender on the inside–cover the pan with foil for the first 10 minutes of baking. This will trap just enough moisture to help cook the cauliflower properly. Remove the foil for the remainder of the roasting time. Still, the cauliflower will remain moist enough to withstand the heat and will not dry up, even as it gains that nice and crispy char! This was the MOST delicious meal. All components blended beautifully. My daughter who doesn’t like cauliflower gave it a seal of approval and asked what I’d done to it to make it so good. Almost every mouthful was met with murmurs of pleasure. I’ve been asked to put it on high rotation on our dinner options. Thank you so much for such a superb resource of meal menus. I confess to not having made the entire veggie bowl yet, but I’ve made the cauliflower (drizzled with Tahini) numerous times, and have tried the couscous as well. The seasonings are excellent with this, and the tip of covering the cauliflower with foil at the beginning works great. When it is cooking, the smell is amazing. Tonight we roasted the cauliflower, and then made the arugula and berry salad, augmented with grilled peaches and toasted slivered almonds. Delicious and satisfying. Thanks for sharing such great recipes. This couscous looks fabulous. I’m a sucker for cauliflower so this is right up my alley. Awesome, Kim! Thanks for stopping in. I have never had this looks really good! I love a good meatless meal and this looks like it would hit the spot for me! How hearty and delicious! I’m witha Catherine! You wont’ miss the meat here. Love those spices on that cauliflower! I’ve been eating a lot of couscous lately…this looks like my kinda recipe 🙂 Yum! everything in this bowl looks amazing! love how simple the flavors are, but they definitely pack a punch! thank you for sharing!